As the Monty Python and Bonzo Dog Doo-Dah Band off-shoot return to the city where Rutlemania began, Getintothis’ Shaun Ponsonby gets under the skin of this bizarre concept. Well, it’s actually happening again. Actually in the actual O2 Academy, actually in the actual city of Liverpool. It’s the return of the prefab four; Dirk, Nasty, Stig and Barry…the fabulous Rutles. This writer is shocked…and stunned…and can’t wait to see their trousers. The Rutles are a bit of an oddity. It’s a project that can be considered an off-shoot of both Monty Python and the Bonzo Dog Doo-Dah Band, starting life as a sketch on Eric Idle’s Rutland Weekend Television as a parody of The Beatles. The idea developed over time, with Idle using the sketch again on his Saturday Night Live appearance across the pond. The Saturday Night Live appearance led to a US TV special courtesy of SNL’s producer Lorne Michaels. A mockumentary on a fake band that pre-dates This Is Spinal Tap by six years, it spoofed The Beatles entire history, from the band member’s personalities (check out Idle’s exaggerated McCartney impression, via his character of Dirk McQuickly), the boundary-pushing concept albums, the movies, “Rutlemania”, their management (Leggy Mountbatten stands in for Brian Epstein, in a manner of speaking), their experimentation with substances like tea, right up to their lawsuit-ridden demise (Stig sued himself in the confusion). The special – titled All You Need is Cash – featured SNL’s then-stars, arguably the strongest cast in their history; John Belushi, Gilda Radner, Dan Ackroyd, Bill Murray (brilliantly playing “Bill Murray The K”, a not too thinly veiled reference to legendary US DJ Murray The K). Also making appearances were Paul Simon and Mick Jagger, discussing the impact that The Rutles had on them personally. Jagger in particular gives some hilarious accounts, such as the time The Rutles wrote them a song (“…and it was horrible, so we never bothered to record it”, he says nonchalantly). Ronnie Wood also appears as a Hell’s Angel in a TV interview being conducted by George Harrison himself, albeit very heavily made up. What are the 50 greatest Beatles songs? Find out if your favourite made our list. Despite all the major cameos, All You Need is Cash was an abject failure on its original broadcast. In fact, it was the worst-rated programme of the week in the US. Let’s consider that for a second. That same TV season saw the broadcast of the notoriously dreadful Star Wars Holiday Special; a project wholly disowned by George Lucas, meaning that the man who gave us Howard the Duck and JarJar Binks was personally offended by the Star Wars Holiday Special. And yet more people watched that than All You Need is Cash. The film has since gained massive cult status, thanks in no small part to its soundtrack. The best thing about The Rutles entire oeuvre is the songs. Neil Innes of the Bonzo Dog Doo-Dah Band (one of three people to successfully sue the Gallaghers for plagiarism, trivia fans) managed to put together a lot of parodies of The Beatles material that sound like three or four Beatles songs at once, but at the same time have them sound like no particular Beatles track. They’re not even dumb, obvious parody songs with silly lyrics. I Must Be In Love could easily be an early Beatles hit, as could Number One and Hold My Hand. There are even people who believe that Innes got his hands on unused Beatles demos and stole the material for use in All You Need is Cash. Innes has told the story of being confronted by a Beatles fan who claimed to have the proof as he had obtained Lennon’s original demo for the song Cheese and Onions. Intrigued, Innes asked him to play it, only to find it was his own home demo for the song. Naturally, we can’t expect the likes of Bill Murray and Mick Jagger to appear on The Rutles upcoming tour, or even Eric Idle for that matter (who, for a long time, wouldn’t let Innes use The Rutles name). What we can expect is Neil Innes, perhaps one of Britain’s most overlooked songwriters owing to the fact that he has a sense of humour, performing the songs he wrote. John Halsey portrayed The Rutles’ drummer Barry Wom – and, impressively, played drums on Lou Reed’s Transformer album – and is also with the group. Ricky Fataar, who played George-a-like Stig, is invited to join them, but remains an in-demand musician, having been Bonnie Raitt’s sideman since the late 70s. The Rutles are one of the more bizarre acts on the circuit. It’s a tribute, but a parody, but with material that doesn’t go out of its way to be funny. It’s a must for anyone who can count themselves as a fan of Monty Python, the Bonzos or even The Beatles themselves. It’s about time we step back inside (or as the Germans say: “Mit mir gekommen“) Rutlemania. Bring your own tea. 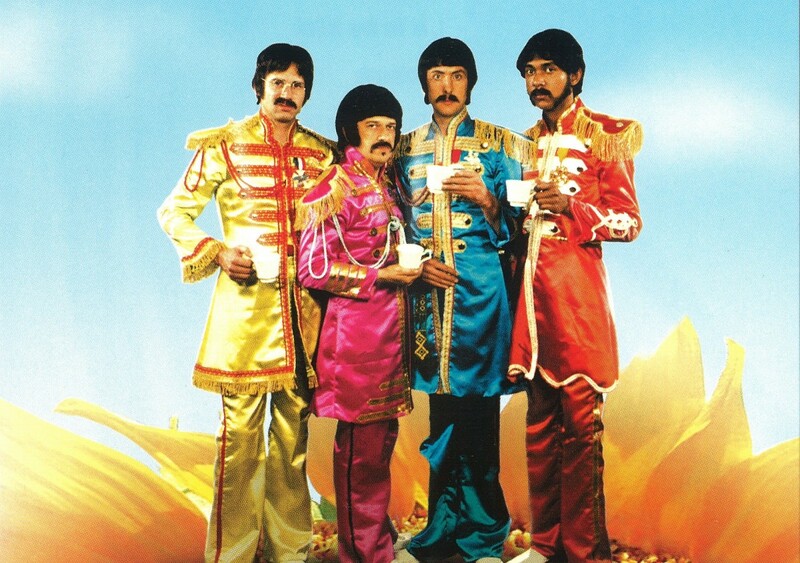 The Rutles play Liverpool’s O2 Academy on Saturday December 5.